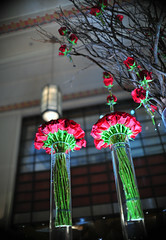 If ever there was a dream team to get behind, it’s Eleven Madison Park, right here, right now. This Danny Meyer gem is currently led by a triumvirate of unusually young savants blazing a hot trail. Together, they’ve trained a talented group of servers, tenders, and cooks (n.1) who seem to have effortlessly captured the respect and praise of tastemakers near and far. In the four years that these three gentleman have overseen the operation together, the restaurant has garnered two James Beard Awards (n.2), four stars from the New York Times, and earned a macaron from Bibendum (not the first Michelin star for Daniel Humm by the way, and not his last one either if I were a betting man), among others. If you’ve read my blog regularly in the past, you’ll know that I’ve applauded them all the way. As I have done in the past, it’s only fair that I let you know upfront that I have become familiar to Executive Chef Daniel Humm and a number of the staff members at Eleven Madison Park. They know who I am. More significantly, they know who my dining companions are (and have been for my last three visits). Mr. RBI and Ms. Toidy Toid & Toid (a.k.a Wizard of Roz) are regulars of the restaurant. Indeed, they are this dream team’s very own varsity cheerleading squad. So how do I write this review without bias? I have to be honest: I can’t. You’ll have to trust that what I write is fair and accurate. But I will tell you this: I seriously don’t think they care who I am other than a diner in their restaurant. If Danny Meyer is one thing, he’s the great equalizer, leveling and raising the playing field for diners of all backgrounds. At his table, everyone is a v.i.p. The three of us ordered the 11-course “Gourmand” tasting menu (I don’t know if I’ll ever have dinner at Eleven Madison Park and not order the 11-course Gourmand tasting menu. If not for the food, I’d order it simply to buy myself extra time sitting under that vaulted ceiling). CLICK HERE to see all the photos from this meal, or click on the course titles below to see each dish individually. À la nage with Sterling Royal Caviar and sauce gribiche. Custard with green apple and shellfish ragout. Lollipop with mint and fleur de sel. Variations of asparagus with Jamon Iberico. Torchon with tête de cochon, pickled Spring vegetables & horseradish. Seared with smoked spring garlic and crayfish. Poached with young carrots, ginger, and Vadouvan granola. Roasted with Meyer lemon, rosemary, and black truffles. Breast with confit potatoes and asparagus. Fricassée of dark meat with morels. 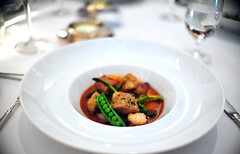 Blanquette with Spring vegetables, tarragon, and crayfish. Tangerine, Grapefruit, Pomelo and Lemon. Cream Cheese Parfait, Rhubarb and Roasted Strawberry Ice Cream. 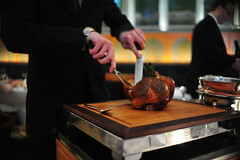 If anyone doubts that Daniel Humm has mastered classical cooking, one has only to order a bird at his restaurant. At my previous two dinners, we’ve added the lavender-glazed duck as a supplement course to the Gourmand. That duck is a wonderful thing. This was one fantastic roast bird. It arrived evenly bronzed (I jokingly inquired of Chef Humm whether he had invented a tanning bed for chicken), darkened with the aid of a thin layer of foie gras, brioche, and black truffles stuffed between the skin and the meat. Humm said it was his mother’s recipe, which left me feeling a little more than cheated. The breasts, which were carved and plated table-side, were immensely juicy and tender (so much so that I also jokingly inquired whether they had sous vide the entire chicken). The stuffing between the crispy skin and meat, which helped insulate the meat from the dry heat, had an earthy, pungently beefy flavor. It was an unexpectedly and deliciously heavy wallop of flavor. It’s not that I don’t like his more modern creations, but I’ve noticed that I gravitate towards Daniel Humm’s more classical side. 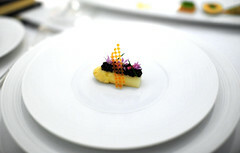 Although his plating style is quite modern, the flavors and concepts of many of his dishes are rooted in the Old World. Blanquette de veau à la Nantua? Phenomenally tender, shocking, really. The pieces of veal practically melted away in my mouth, enrobed in a fine, meaty reduction sauce. Atlantic Halibut, nicely roasted, arrived with an immensely rich shellfish bisque (reminiscent of the “Nova Scotia Lobster” bisque) pooled in a ring of potato purée. The wine pairing was especially good, highlighting the garlic in the dish in a wonderful way. I was especially pleased to see Humm’s latest iteration of foie gras escape the hackneyed “foie gras as dessert” story, opting instead for a more savory coloring. This was foie gras as pâté, and I loved it. Prepared au torchon with a core of tête de cochon, the slice of foie gras came with a gem-like rainbow of pickled Spring vegetables, tête de cochon gelée, Dijon mustard, and freshly shaved horseradish. Was that chimichurri-like sauce made from ramps? I’m not certain, but it was delicious. Warm strips of pressed toast arrived on the side, tucked in a blanket. Together, it was a beautifully updated classic. The vegetables at this meal were particularly good. “Spring Out of Winter” framed a lovely picture of an early-season sprouting, with tender baby asparagus and pea shoots peeking from under a frosty blanket of “free form” creme fraiche ice cream (frozen with liquid nitrogen) and shards of dehydrated almond milk. Silky, double-shucked peas dotting the plate made everything look and taste pretty. And a ribbon of waxy prosciutto punctuated the dish with a hit of saltiness. It was simple, beautiful, and delicious – a variety of flavors and textures. Could this hyper-organic dish have been an inspiration from Chef Humm’s recent trip to noma? The young carrots in the “Nova Scotia Lobster” were so beautiful, so tender, and the frothy ginger-shellfish sabayon and a spoonful of crunchy “vadouvan” granola so playfully delicious that I nearly overlooked the lobster. Lobster is never superfluous, but here it was not the star. 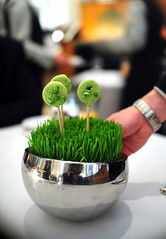 If there was one disappointment for me in our twelve-course dinner, it was the “Garden Pea” lollipopsicle. The frozen pea sucker was flat on flavor, its natural sweetness dulled by the chill and undone by an over-salted crust of chopped frozen peas. And I found the “Santa Barbara Sea Urchin,” served in a hollowed eggshell, just a bit unbalanced for my taste, light on sea urchin (it really was more of a seafood ragout), heavy on acid. But, as with the “Kumomoto Oyster Sundae” at my last meal, I learned to appreciate this dish better by mixing all the contents together instead of spooning off a cross-section of strata. The flavor improves the more the ingredients come together. The cheese program here has blossomed; it really has. 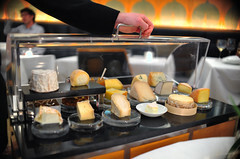 Once offering a decent selection, now the restaurant’s cart houses a wonderful variety of artisanal gems from around the world. This time I especially enjoyed a perfectly ripened Petit Sapin, scooped onto my plate with a spoon. I also revisited the Dallenwiler Wychas, a particularly golden alpine cows’ milk cheese from Chef Humm’s home country. Angela Pinkerton, the restaurant’s executive sous pastry chef, does wonderful things with fruit. Last year, she wowed me with a carpet of black mission figs dusted with candied pistachios and topped with milky ricotta ice cream. But Ms. Pinkerton’s crowning achievement was painting a dish red with velvet, a fruit-filled twist to the otherwise expected chocolate ending. Indeed, the square of “Red Velvet” cake was the least interesting thing on the plate. 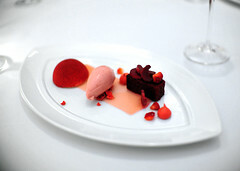 Instead, I was drawn to a velvety turn of roasted strawberry ice cream sitting on a velvety strip of pink rhubarb gel. To one side, a dome of cream cheese “parfait” enriched with white chocolate. If that wasn’t velvety, I don’t know what is. Slices of dehydrated strawberries and little red meringue kisses gave the dish *snap. * Visually stunning, dripping with creativity and wit, upending expectations with its dynamism, and backed by genuine talent, it was the Lady Gaga of desserts. As any good meal should, the Gourmand ends with booze and candy. They dropped off a bottle of cognac (strong enough to singe the hair off your chest, or put hair on it) with glasses, a d.i.y. aperitif. Ms. Toidy Toid & Toid and I, largely teetotalers, were provided a bottle of non-alcoholic sparkling cider instead. 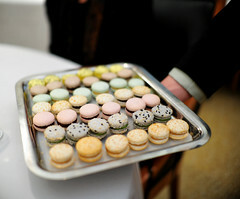 With these drinks came Eleven Madison Park’s famous tray of pretty little macarons, neatly lined in rank and file (pink peppercorn-caramel!). It says that I am treated well there. It says that I think the food is excellent. But, most importantly, it says that they’ve earned my respect. To read about the other meals I had on this trip to New York, CLICK HERE. n.1 James Kent, currently a sous chef at the restaurant, has been selected and is being groomed by the likes of Daniel Boulud and Gavin Kaysen to represent the United States in the Bocuse d’Or next year. n.3 Because the duck is presented and carved whole for two, it’s offered as the main course on the 3-course prix fixe menu, but not on the tasting menu. Ms. Toidy Toid & Toid had told me about the poularde (normally served at lunch only) and sent me a link to a snapshot of the beautifully burnished chicken on her Flickr photostream. One look and I was smitten. n.4 I was unexpectedly treated to this meal by my gracious hosts. But I don’t think we were charged for the chicken supplement. And there might also have been some un-billed wine for Mr. RBI. n.5 I don’t think that it’s a coincidence that the title of the reviews for my previous three meals have all been celestially-minded (2007, 2008, and 2009). ~ by ulterior epicure on May 25, 2010. 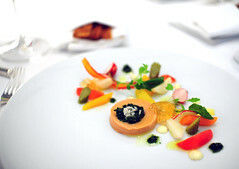 @ Laurent: I hope you do find time to enjoy a meal at Eleven Madison Park. It’s a really bright star right now. Thanks for visiting my blog from all the way over there. I had a rather quaint lunch at Au Gastronome years ago. I know it lost a star shortly after I was there; but how is it doing these days? UE – Great review. FRI – Your link tot he burnished chicken is broken. I think it’s funny that you said the dark meat (which is generally considered more flavorful and moist than white) was as tender as the breast meat. @ David: Thank you. The link has been fixed. 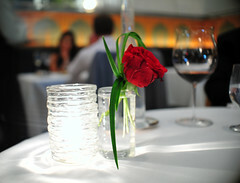 Au Gastronome has still one star, but is for sale. If you want to have a idea how hot and not visit the site of culinariasquare.be and flemishfoodies.be. They give the new trends in belgium about cooking. It’s not complete but it gives definitely a good impression of the cooking right now. went last fri. with my wife. almost had a perfect meal. my only criticisms were the long gaps between courses and the average desserts (i find most desserts underwhelming. the only dessert that was on par with the rest of my meal was at Telepan). During the wait, they poured our wine long before the course arrived. is that normal? we’ve been to a few other 4-star NYT/3-star michelin, and i don’t remember that being the case. we ordered the 3 course prix-fixe + duck for two. the meal was close to 4 hours. is that normal? we joked with the tall red-head with the endearing quirky grin that an 11-course tasting must take all day. i had a lovely time with my wife, so it didn’t bother me that much, but i lost my food momentum by the time the duck got to the table (ended up enjoying it better the next morning). that being said, i can’t wait to go back. 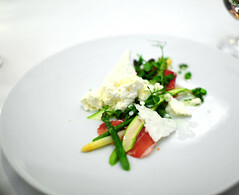 I was lucky enough to enjoy Daniel Humm’s food when he was the chef at Campton Place in San Francisco. It’s been amazing to see how his career has skyrocketed. Well deserved, too, for such a talented chef. @ Eric: I suppose everyone has their own preferred pace. I’ve certainly had 3-course meals clock in around 4 hours (not at Eleven Madison Park, per se, just generally), though I will say that that falls on the long side of the norm. However, what matters is that YOU thought the pacing was slow. It’s a shame that it detracted from your experience. @ Carolyn: I’m sorry I never had the opportunity of eating at Campton Place. I agree, his new-found acclaim in New York is well-deserved. it was our first time there. like i said, it was almost perfect/the best meal of my life based on the food and energy of the staff. like having to give a %97 when a place deserves a %100. That’s why it was just a little sad that the pacing was off, and maybe we didn’t pick the best desserts. i had the souffle with passion fruit, and my wife had the Chocolate Peanut Butter Palette. we were expecting so much from the Chocolate Peanut Butter Palette. the description of the dessert was better than the execution, especially the popcorn ice-cream. still can’t wait to go back. @ eric: Desserts are usually the least interesting part of a meal for me. 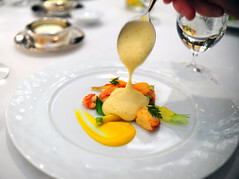 But I have to say that I’ve always liked the souffle at Eleven Madison Park. I believe you had this one (CLICK)? As for the Chocolate Peanut Butter Palette (CLICK), I can’t fairly comment since I’m not easily woo’ed by peanut butter, or chocolate desserts. Perhaps, like me, you might like the fruit-based ones better. @ Eric: I know, I’m truly blessed to be able to eat so well so often. I often have to pinch myself. Cafe Boulud is really on its game right now. In fact, I’m going back soon. Let me know how you like Cafe Boulud when you make it in. I’m a fellow EMP fan. I’m also a cocktail enthusiast, and I appreciate the photo of the Air & Rye and Oaxacan Cup. What have been your experiences with the cocktails? 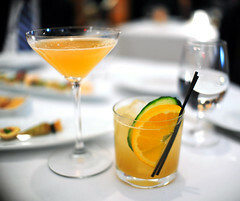 Did you have either of the two pictured drinks in this review, and if so, how were they? Hi, I just came across your blog while researching Dallenwiler Wychäs. I thought I would clarify that Dallenwiler Wychäs is made from pasteurized goat’s milk. Keep writing — I like your style and overall aesthetic.